626 Main St. (Darlington, WI). and then a right onto Main St. The Lafayette County Courthouse is not your typical "run of the mill" courthouse. From the time construction was started in 1905, until it's completion in 1907, everything was paid for, by funds from one single donor. When Matt Murphy passed away in 1903, he asked that 70% of his estate went towards the building of a new county courthouse. What was the final cost of this generosity? In 1907, the total construction cost of the Lafayette Courthouse, was $136,556.17. 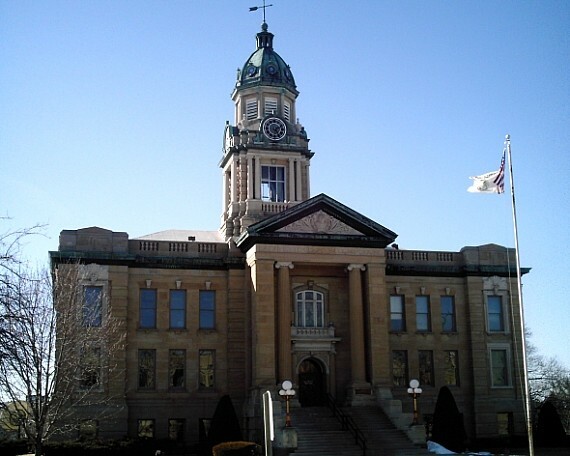 To this day, the Lafayette County Courthouse, is the only courthouse (still in use) in America, that was paid for by one single person. In 1978, the Lafayette County Courthouse, with it's Tiffany glass rotunda, was placed on the National Register of Historic Places. An apparition has been seen staring out of the windows on the 2nd floor of the courthouse. The spirit is also said to roam the halls on the ground floor of the building. There are many different theories as to why the courthouse is haunted. delivering building materials to the job site. an angry mob, and lynched. Could the ghost even be that of Matt Murphy (the sole fiancial contributor to the building of the courthouse). Just keeping an eye on hisinvestment. Again, many theories, as to who haunts the Lafayette County Courthouse, but no hard facts.